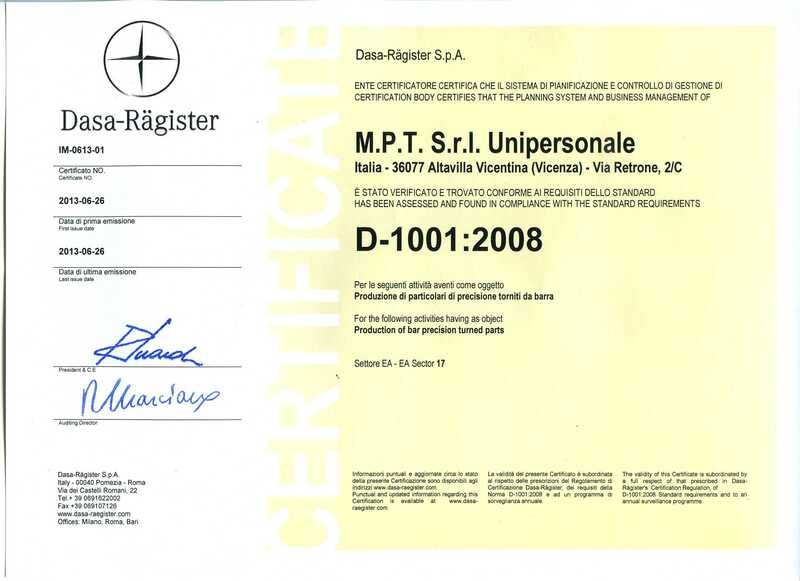 All contents available on the website www.mpthitech.com, which owns the MPT Unipersonale SRL, with registered offices at (36100) Vicenza, Via D. Meschinelli 90 and its operational headquarters in (36077) Altavilla Vicentina (VI), Via Retrone n. 2 / C- Italy, can be used only with permission of the copyright holder and for informational purposes only or personnel, is strictly forbidden to carry out any commercial use or distribution on another computer, it is also forbidden to modify the content on the site itself. It’s forbidden any other form of use. To the Violators will be applied civil and criminal penalties. It’s forbidden too the reproducing by potential competitors in the graphics of the website of the company which is the owner or any other site developed, licensed, or controlled by the company itself. No logo, graphic, sound or image from the website may be copied or reproduced without the express permission of the company. The contents of this site are protected by trade agreements and their use is in accordance with the laws governing copyright, unfair competition, and other laws and can’t be copied or imitated. The M.P.T. SRL is not responsible for the information contained in the web pages which owned the site and those of any development and related graphics or for any violation of the rights of others and damages, including indirect, consequential to it, or any other damages of any kind, including resulting from loss of the right of use, loss of data or profits or descendants from breach of contract, negligence or other damaging action, arising out of or in any way connected with the use or information available on this site. The Company is not responsible for technical inaccuracies or typographical errors, and all information is subject to periodic changes. The Company may make improvements or changes in the products and programs described in this site at any time. The names of actual companies and products mentioned in this site www.mpthitech.com may be trademarks of their respective owners, has done so expressly forbidden to unauthorized use of the same. All rights are reserved unless expressly specified indications.